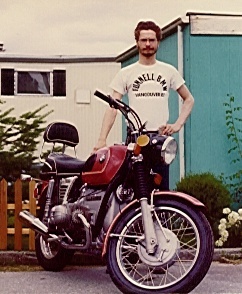 While working at the BMW motorcycle store in Vancouver, from time to time we would have the responsibility of delivering a bike out to the customer rather than have them come to pick it up. 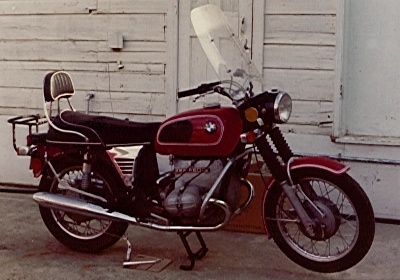 In the spring of 1973, Gus Borger bought a new BMW R60/5. Gus couldnt come and pick it up, so a deal was made where we would service the bike, put some miles on it, service it again, then deliver it. Delivery was to be to High Level Alberta, for as far away as High Level was, it may just as well been Alaska. Because of other pressing matters, Philip turned the service and delivery of Guss bike over to me. For 1973, my favorite color was the very color of Guss bike, Porsche red. After removing from the crate, I treated Guss bike as though it were my own. I would ride the bike back and forth to work, run errands as well as popping about on the weekends. I really liked Guss bike but as it turns out, it had a few teething problems. On one of my weekend outings, my mother wanted to ride with me. One of my favorite roads (for loosening up the suspension) was a gravel road that wound its way up towards Garibaldi Provincial Park. We soaked our feet in a clear as glass lake and watched the minnows as they zipped about. On the way back from the lake, a deadfall rolled down the side of the mountain and flopped down on the road blocking our path. To the right of the deadfall there was still a bit of shoulder I felt we could pass on, so I went for it. Part way past the deadfall our forward motion stopped, in fact, we started to go backwards! Seems the shoulder of the road was unsupported and gave way as I rode over it dropping us over the side and into a very deep gully, making us totally invisible from the road. With the bike pointed straight up, I tried unsuccessfully to push it back up to the road. If it hadnt have been for the little tree the rear tire was against, goodness knows how far down we would have gone. After working up a good sweat, I shoved my mother up to the road while I tried to figure out what to do. A few minutes later, a couple of fellows happened along in a Jeep. Seeing my mother standing alone way out in the middle of nowhere made them more than a little curious, so they stopped to see if she was ok. After a very short story, between the two fellows and myself, we got the bike back up and on the road. Seems they made a habit of carrying a chainsaw with them on this road, which made short work of the deadfall. Once back home, I inspected the bike for damage. Thanks to the fact we basically sunk in dirt, no damage was present. The next week found me with enough miles on Guss bike that I gave it a first service and made preparations to deliver. On a cool Thursday morning I was off in the direction of Guss house, I figured it would take me about two to three days to get there. Cruising up the Frazer Canyon towards Cache Creek, the bikes valves started to make an awful racket. Pulling into Cache Creek I had resigned myself to needing to perform a little highway service. Slipping behind my favorite gas station, out came the tool kit. I noted the oil pressure light came on when the engine spun down to idle so I immediately checked the oil level; it was just right, funny. When I tried to adjust the valves, the motor just got noisier. Again the oil light was coming on, something was very wrong. I called back to the shop and informed Phil I couldnt go any farther and didnt feel the bike would make it back either. Several hours passed before Cliff Oats (our salesman) arrived with a van to rescue me. I received some heavy teasing about not being able to take care of myself on the road. The teasing continued back at the shop until the cylinders were lifted. Seems the camshaft had broken at the oil pump, the shop became very quiet, this kind of breakage was unheard of. An emergency parts order was called in to BMW but the parts would not be in for at least 4 days as we were at the edge of the weekend. With the knowledge the parts were on their way, I went ahead and pulled down the engine to try to save some time. The following Thursday I was again on the road. I crossed my fingers as I cruised past the Cache Creek gas station with the bike running great. 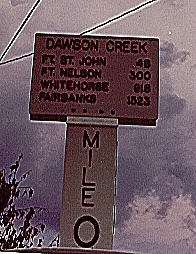 The next day found me threading my way up to Dawson Creek where I stopped for the night. It didnt seem dark enough to stop but then again, being that far north, it never did get dark. I had a hard time sleeping, I just wasnt used to it being light all the time. I finally got tired of trying to sleep and got up very early for breakfast. Judging by how busy the diner was, I wasnt the only one that couldnt sleep. I had high hopes of getting the rest of the way to Guss place this day and the sooner I got going, the better. Finishing up my final checklist, I fired up the bike. No sooner had the bike started, a new problem became painfully apparent. In 1972, BMW had a problem with over-shim in the transmissions, causing premature wear of the small bearing of the cluster shaft. The problem was supposed to have been fixed for 1973, so much for that correction. Another desperate plea was made over the phone, this time I was too far away to come and rescue. This time I had to rescue myself. Philip put together all the necessary tools and parts for the repair, packed them into a wooden crate and shipped them to me by Greyhound Bus lines. While waiting for the tools and parts to arrive, I scouted about the town for a motorcycle shop. There was only one shop that serviced motorcycles. I guess more of a snowmobile, chainsaw and lawnmower shop than motorcycle. I went in for a visit to see what they were like, the owner/ salesman was not a very pleasant fellow, but the mechanic was very open to helping me in any way he could. Dan, the mechanic, was limited in the ways he could help as the owner told him to ignore me. After visiting with Dan a couple of times, we devised a plan of how to get the job done without having problems with his boss. Transmission out, all the tools and parts are tucked away in the crate behind the bike while I toddle off for a lunch brake. Here, all the businesses (except the restaurants) close for an hour at lunch time. When the crate of tools and parts arrived (the next evening), I carried it down and placed it in the alley behind Dans shop. Dan kept an eye out for it and drug it inside the back door at closing time. Dan met me the next morning behind the shop a couple of hours earlier than he needed to but that was all part of the plan. I had the transmission out and the rear flange pulled before the shop opened. There was no source of heat available to remove the cover from the transmission so I had to improvise. My improvisational techniques were misunderstood by the local auto salesmen, but luckily not enough to call the fire department. To get enough heat to open the transmission, I resorted to pouring gas on the cover and lighting it with a match. This method was repeated until the right temperature was obtained. Crawling around on the ground mixed with not having a good working situation, getting the bearing replaced and the transmission re-shimmed took pretty much all day, without Dans help, it would have taken a lot longer. With the transmission now done, I was back on the road the next morning. Mechanically, the bike went the rest of the trip without a hitch. This next problem wasnt any fault of the bikes, this time it was the road. Up in this northern portion of Alberta, the roads suffer quite badly in the spring and fall with water getting under the road surface, freezing and causing the road to buckle. The highway maintenance crew, this year, felt the road had to be torn out and rebuilt. The way they achieved this was to stop all the traffic (me at the front of the line of course), move a very large Caterpillar tractor onto the road, stick huge hooks into the road surface, then start pulling up the road. After the tractor got far enough ahead, the workers signaled for us to follow the tractor over the mess it was making. I, to this day cant understand the mentality at work here, sure, the road had frost heaves but it was a good deal better than riding over this mess of dirt, gravel and huge lumps of asphalt. Luckily, this only went on for about 10 miles before the tractor pulled off the road. I never came to grief, but there were some hairy moments. Following the directions, I arrived at Gus Borgers place in the early afternoon. His whole family came out to meet me and their new motorcycle. After explanations of why it took so long for me to get there and showing him some basic service tips, I was delivered to the local airport. Still wearing the dirt and bugs from the trip up, I boarded a small plane and flown to Edmonton. From the puddle-jumper airport I was taken to a very fancy hotel where I was to wait for the airport shuttle to take me to the real airport. While waiting for the shuttle, Klondike days was in full swing. Watching the people swagger about in their finery was quite a treat. I took the time to wash up in the bathroom there before being whisked off to the airport and home. From time to time I think about Gus Borger and the ride up to his place. I also wonder how different the trip back might have been if I had accepted his offer to stay the night and head out in the morning.